California wouldn’t be the same if the earliest Europeans hadn’t brought along some of their favorite crops. The olive is one such. Some curmudgeonly diners may scorn the preserved olives, but love for the silken oil that can be squeezed out of them is nearly universal. But, for every good thing in life, there seems to be a bad. And olives have their nemesis. A particular species of fruit fly (Bactrocera oleae) has long found the olives of Mediterranean countries to its liking and, now, it has found its way to California. This tiny fly has the nasty habit of many other fruit flies; it lays its eggs inside the developing olives. They hatch and the caterpillars begin to eat on the tasty and nutritious flesh around them. Along with the deposit of eggs, a naturally symbiotic bacteria is introduced. The bacteria breaks down the olive and the grubs are able to benefit even more. Not only do their tunnels ruin the fruit, fungi can invade and oxidation of the remaining flesh completes the job. They do have favorites, but will use just about any variety they come across. Each olive fly can lay hundreds of eggs in her lifetime, but even a small infestation of just a couple of larvae per olive is enough to ruin the crop. Growing olives has become a major industry in California with huge orchards being planted nearly everywhere that land and water are available. In addition, smaller, boutique orchards are springing up, producing small batches of perfectly squeezed oil, and often incorporating other flavors for a high end product. So, the olive fly has become a great concern. And efforts to control the flies and treat the trees have paid off in some useful techniques. 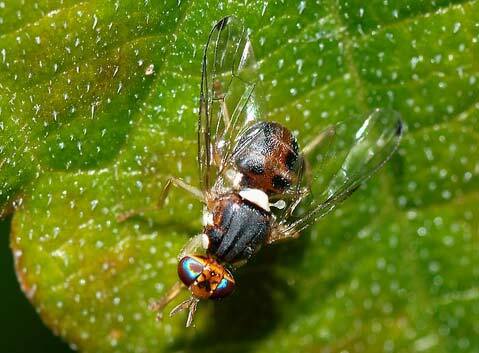 Investigators have found that the flies remain active nearly year round in much of California, so diligence is required to monitor their populations and curb them early in the formation of the fruit. Research is under way to develop a natural pest to control this pest, but may be some years off if it can be found at all. As with many insects, understanding their life cycle and behavior patterns can lead to treatment options. One of the simplest is a sticky trap. The olive fly, along with many other insects, finds yellow just the happiest hue and when a sticky substance is spread on a simple yellow card, they will land and never fly again. Replacing the cards periodically is all that is required. Male and female insects also often rely on the production and detection of pheromones to find each other and mate. Savvy farmers can put out decoys and trap those horny little fellows. The major attractants available are synthetic compounds that closely mimic what a female releases to attract her mate. A few other compounds that attract both sexes can be used as well and manufacturers have come up with several versions of traps baited with these decoys. For technical information, check with your Agricultural Commissioner’s office. One simple trap that even a small grower can produce is made from a plastic water bottle with several holes drilled in it and baited with a solution of Torula yeast and water. Directions and recommendations on the number and placement of traps for best success are on the web pages of the Olive Source in Santa Ynez (oliveoilsource.com/olive_fly.htm). Why should the general public care about this pest? Well, given the number of olive trees that are planted for purely ornamental reasons, there are thousands of sources of infection for the unfortunate farmers who are trying to depend on their crops for a living. Many of the landscape trees are “retired” from fruit production and relocated to landscapes where they continue to flower and fruit. And support generations of olive flies. If you are contemplating planting olives, consider using one of the fruitless varieties such as ‘Bonita,’ ‘Majestic Beauty,’ ‘Swan Hill,’ or ‘Wilsoni,’ or the dwarf ‘Little Ollie.’ It is also possible to spray the mature trees with a natural plant hormone to stop them from flowering. Two commercial products to look for are FruitStop or Florel. Sprays should be timed to catch the earliest flowering around March and April in most places. If those options don’t fit your situation, setting out traps will help catch and dispose of the flies. Unfortunately, other insects may find them attractive, too, but if correctly used, can go a long way to alleviating the problem without posing too much of a threat to beneficial species. With our help, this agronomic problem can be brought under control.